We’re visiting my mother and grandmother in northwest Arkansas. They are at an age and in a place where politics are discussed, religion is assumed and passion is reserved for the important things, such as the best variety of peach and the premiere source for the crème de la crème of watermelons. For instance, my grandmother has incredibly high standards for watermelon. She judges them by the sound made when the knife cuts into a whole melon and it splits. If it’s not the right sound, she won’t even bother tasting it. Watermelon that I think is wonderful she merely scowls at. They take their fresh fruit very seriously here. 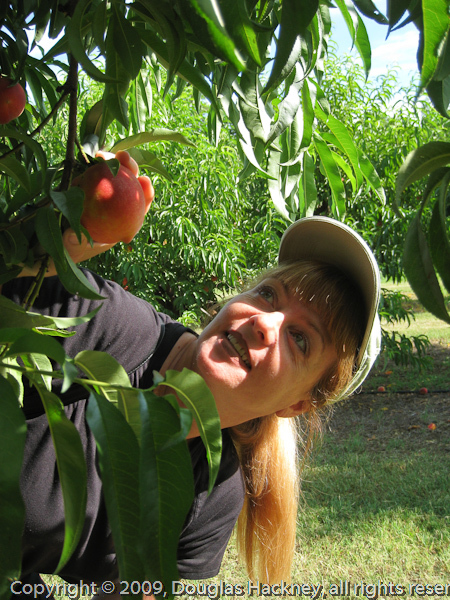 Over the years, I’d often heard them speak of glorious mornings spent up on Round Mountain picking peaches; so we took the opportunity to visit the orchard and sample the fare. We were a bit late, not arriving until 8 AM, long after most of the thirty cars that had been waiting for the 7 AM opening had picked their fruit, loaded and departed. I wished I’d been there to personally witness the Oklahoma Land Rush charge from the parking lot to the four rows tagged with ribbons signifying the fruit ready to pick. 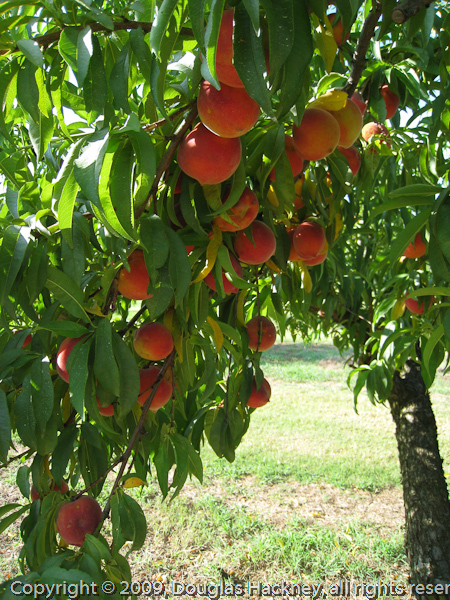 But even though the locusts had already descended, there were still plenty of peaches remaining on the trees. 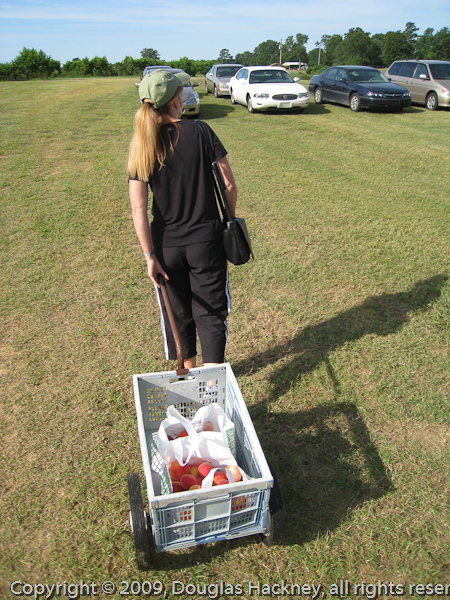 And true to mom and grandma’s word, the trees were low, accessible and loaded with fruit. Which yielded smiles all around. And a bounce in the step on the way to the car. 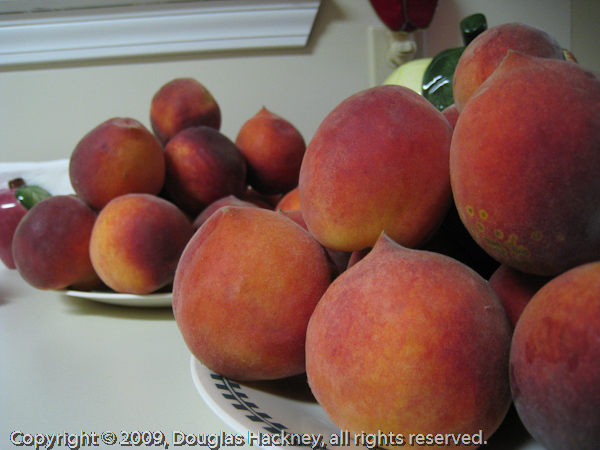 And once home, the picking yielded fresh peaches on just about everything, starting with vanilla ice cream and worked all the way through the spectrum to a quick batch of peach cobbler. Of course this variety of peaches, Harkin, was judged severely by the mother and grandmother judging panel. The Harkins were deemed “OK,” but far short of their favorite, the Loring. Mom and grandma won’t have long to wait, since the Loring peaches will be ready to pick soon. Until I visited the orchard I had no idea there were so many varieties of peaches, which labels me immediately as a city boy Yankee. In these parts, you not only know the varieties, you know when they ripen, which tree produces the best examples and which variety you–and your grandmother–prefer. If you are ever in the area during picking season, it’s worth an early morning trip to Round Mountain. This entry was posted in 2009, Americas, Cultures, Timeline, Travel, United States. Bookmark the permalink.